Zombies are invading our life. If you don’t mind your screens are full of these terrible guys, the following zombie styled coffee mug should be able to catch your eyes. 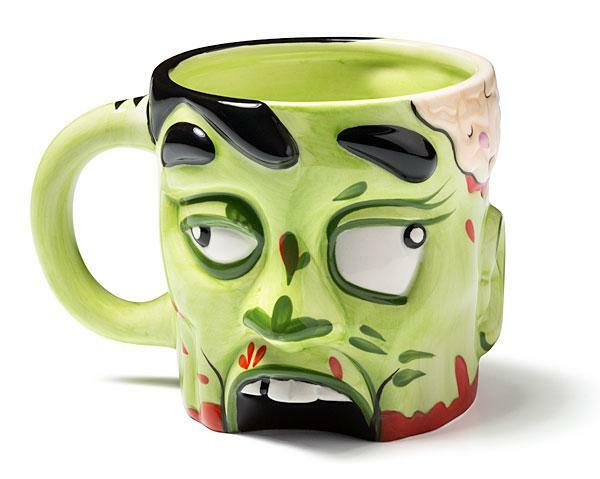 This is an interesting coffee mug inspired by a zombie that lost the top of its skull. The coffee mug is made of sturdy ceramic, and as we can see from the images, the ceramic mug is shaped a zombie’s head, and comes with subtle details and rich colors, of course, you won’t worry about the cartoonish zombie head biting your hand, and the hollow head is able to hold 16 ounces of liquid goodness in order that you can enjoy your favorite coffee or tea in a zombie hunter’s way.The zombie styled coffee mug is priced at $12.99 USD. If you’re interested, jump to ThinkGeek for more details. Additionally, also don’t miss the zombie head shaped cookie jar.